The Lion of the Tribe of Judah, the root of David, is Christ (Matthew 1:2-16). He is mankind's only Savior (Matth.1:21); because no-one else can deliver mankind from the darkness of ignorance and from the abyss of sin (Acts 4:12). "Afterwards I looked, and saw standing between the throne and the four living creatures, and in the midst of the elders a Lamb, as though it had been slain. This Lamb had seven horns and seven eyes, which are the seven Spirits of God sent out to all the earth" (Revelation 5:6). 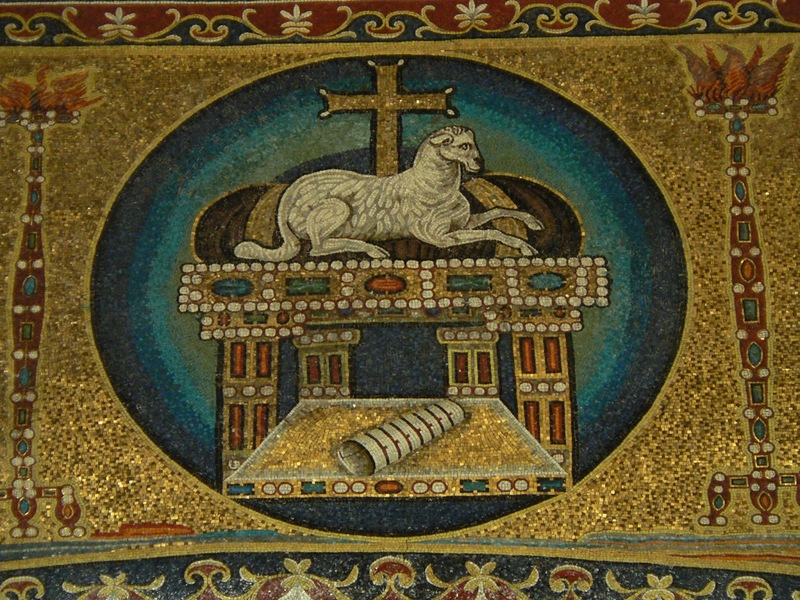 The upright stance of the Lamb denotes the Resurrection of Christ and in fact the Resurrection of the Lord's entire Body; because, as the Apostle Thomas was called on to see Christ's wounds in His resurrected Body, in the same way John also saw the Body of the Lamb marked by the wounds. This is the reason why he says "as though it had been slain." But the Lamb's posture was upright. This means John saw the resurrected Body of the Lord, and in fact, in all its omnipotence (the seven horns) and His omniscience (the seven eyes). The four living creatures represent the entire Church, which will be reigning together with Christ. "Then the Lamb came and took the book from the right hand of Him who sat on the throne. And when He had taken the book, the four living creatures and the twenty-four elders fell down before the Lamb, each having a harp, and golden bowls full of incense, which are the prayers of the Saints. And they sang a new song" (Revelation 5:7-8). 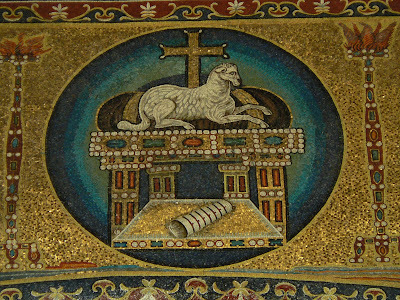 In other words, we observe that the entirety of the Church offers a veneration of worship to Christ, while it lauds and exalts not only God the Father, Whom John sees seated on the throne, but also the God-man Christ: "And I heard every creature which is in heaven and on the earth and under the earth and all such that are in the sea, and all that are in them, saying: 'Blessing and honor and glory and power be to Him who sits on the throne, And to the Lamb, forever and ever!' Then the four living creatures said, 'Amen!' And the twentyfour elders fell down and worshipped Him..." (Revelation 5:13-14). On the basis of the Holy Bible, we cannot give any other interpretation to this veneration. Veneration of worship belongs only to God (Matthew 4:10, Deuteronomy 5:9, 6:13). The Apostle John falls at the feet of the Angel to worship him, but he responds to him: "Do not do this. I am a fellow servant, as you are and as your brethren are who offer their testimony for Jesus: worship It is to God that you should offer veneration of worship" (Revel.19:10). In these last times, to which John's Revelation refers, the veneration of worship is inconceivable, even when it has to do with an angel. The reason for this is that worship is an exclusive right that belongs to God. If, then, the entire Church is portrayed in the Book of Revelation as worshipping the Son just in the same was as she worships the Father, this happens because she recognizes Christ as true God, or, as the Epistle of Judas puts it, as "the only Master and Lord" (Jude 4). The Holy Bible further underlines that those who do not acknowledge Christ as "the only Master and Lord" (Jude 4), that is, as God, are exposed to the danger of death and that consequently, it is the duty of each and every Christian to strive in every possible way to lead them to the faith of Christ, and thus "pulling them out of the fire" (Jude 22). In order therefore to live, it is imperative that we believe in Christ, because "He who believes in the Son has already everlasting life; but he who does not believe in the Son shall not see life, but the wrath of God will abide with him" (John 3:36; see also 14:6 and 1 John 5:12- 20). "He was in the world, and the world was made through Him, but the world did not recognize Him. He came to His own, and His own did not accept Him. But, as many as accepted Him, to them He gave the right to become children of God, that is, to those who believe in His Name: who were born, neither from blood, nor from the will of the flesh, nor from the will of man, but from God" (John 1:10-13).